There are many conflicting opinions and studies regarding the effect that the minimum wage (MW) has on employment, particularly the employment of teens who often work at jobs that pay MW. Some studies show an increase in employment of teenage workers after the MW is increased. Some show a decrease, some show no change. A 2006 paper by two economists at the University of California reviewed early studies of MW prior to 1982 and those after 1990. Methodologies, correlations and conclusions in one study are criticized in another study. Reading just the first six pages of the 150 page paper will give you a sense of the arguments. How many people does the MW affect? Is it only those making the MW or does it also include those making just above MW? What is the effect on the local economy as well as local employment? Whatever you want to claim about MW, you can probably find a study in this area that will backup your claim. What we can know for certain is that the MW has declined in real dollars over the past 50 years. Using MW data from the Dept of Labor and a CPI calculator from the Bureau of Labor Statistics, I have graphed the minimum wage in both current dollars and real inflation-adjusted dollars. From 1963 to 2012, the MW has fallen 17%. 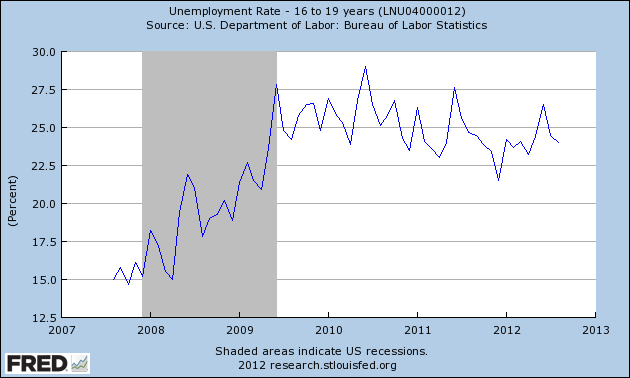 The unemployment rate for teens aged 16 – 19 stays stubbornly near 25%. The unemployment rate for those aged 20 – 24 years has been steadily declining since late 2010 but has ticked up in the past few months. 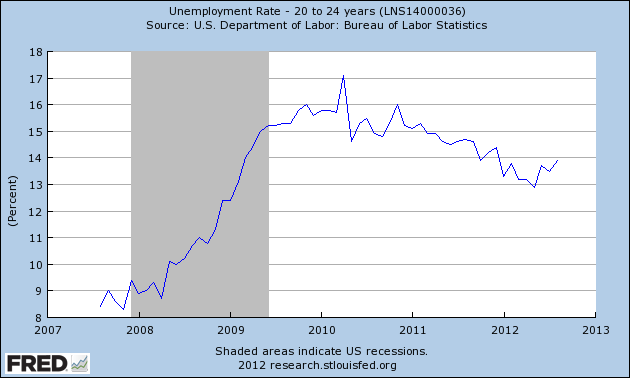 Low wages and high unemployment breed a sense of futility in young people entering the work force. During the late sixties and early seventies, the prospect of being drafted into the Vietnam War prompted many high school male graduates to go to college to gain a student deferment from the war. Almost fifty years later, this generation of high school graduates – both men and women – feel the pressure of having to go to college to escape the bleak job prospects of this labor market. As I wrote last week, older people are continuing to hold onto jobs, making it doubly difficult for young people entering the labor market supply chain. Few young people can comprehend the multi-decade generational employment mechanism. In our late teens and early twenties, we first step on the slow moving employment escalator, gaining experience, knowledge and judgment as we work for relatively low wages. During our working years we build our skills and the amount of money our labor can command. For too many young people waiting to step on this job escalator, the escalator is broken. Each year more young people gather at the base of the escalator and wait.